It’s the last day! I’ve really enjoyed this round of Thirty Chic Days and I hope you have too. What amazing thing do I have up my sleeve for the thirtieth chic day? It’s something I learnt from this past month and that’s if you set yourself a deadline, you can do it. You can do it even if you thought you couldn’t. Having constant chic thoughts in my mind has also been helpful in remembering my overarching goal of living beautifully. I had hardly any time of slacking off but I don’t feel like I missed out on that. And because of this there was not that residual guilt of laziness. June wasn’t all work, work, work though. I enjoyed time I had to myself more when I made myself busy with a daily post as well as my full-time job. Looking forward to my current book(s) was a real treat, as was my nightly tv viewing of a good series like Downton Abbey or a movie. So even if you don’t write a blog, perhaps you could come up with a small challenge for yourself. Maybe in a notebook or journal some goals you want to cross off in July, or by a certain date. I think I will do this with some sewing projects I have been moving slowly on. With my posts, I can see they are actually a beneficial addition to my life and not just another thing on my to-do list. Posting daily also helped me enjoy life in a meaningful and in-the-moment way. Other months fly by and I don’t know where they went. Not June though! I really stretched it out, particularly in the middle of the month when I knew I still had so many posts to go and was flagging a little. My new goal for How to be Chic is to post weekly on a Friday, and possibly a Tuesday but I’ll start with one day a week for now. Surely I must run out of chic things to talk about (you’d think). But thankfully for me and my curiosity there are many ways to approach living in a simple and elegant way that I want to explore. I’m keen to know if you had a favourite post this past month, and have you tried anything from an idea you came across? There were many things I’ve tried thanks to your wonderful comments. I loved them all! I enjoyed your 30 days of chic. I can't say I make lists or keep a journal on a regular basis, but I certainly feel more productive when I do. I also like to use the app Evernote, since I can sync lists between by tablet and (home) laptop. It has been so wonderful to open my laptop every morning and start the day with a new blog post from you. I really needed the inspiration right now. Let's just say that life has been busy and not kind to me lately and I feel anything but chic. Your writings really has reminded me that chic is in the little details. I will try my best to regain my chic thinking in July. Your posts have inspired me to concentrate on those things that really make a difference. I particularly enjoyed the focusses on grooming and healthy habits. This was an enjoyable journey. Thanks so much. I do not know much about your country, but the general sloppiness with dress here in the US boggles the mind. Thank you so much for taking the time to do this. I enjoyed each and every post! Hi! Just found your blog yesterday and I loved it! I'm reading all of your posts and I'm definitely gonna put some tips in action. Thanks! Thank you for sharing your many beautiful ideas! I have so enjoyed opening your blog each day of June. One of my favorites was your "Wonderful You" post. It is so easy to be hard on ourselves--I'm working on being kinder to myself! Your inspiration is much appreciated. i have just spent the last two days reading every single one of your posts. i am so glad to discover you fifi. french country cottage dot blogspot dot com. thinking you will love it! Hi, I too have loved the posts, and the main thing I am going to take from this, is to be more mindful, like yourself, this to me is the most important thing that came across. We live in such a fast paced, hedonistic world, that we rarely stop even to think properly, let alone check what comes out of our mouths! So for that, thank you very much Fiona. Best wishes. I can't believe the 30 chic days is over already! I've so enjoyed your series, as I enjoy all your posts, and I'm looking forward to reading your thoughts weekly. This series has been full of good thoughts and information, and I'm particularly looking forward to using some of your tips to remain calm, elegant, and chic through what is going to be a very stressful month. Thank you for your dedication and for remaining a source of so much inspiration. Thank you for your 30 days of great ideas and inspiration. It was such a treat to know there would be a new post waiting for me every morning. 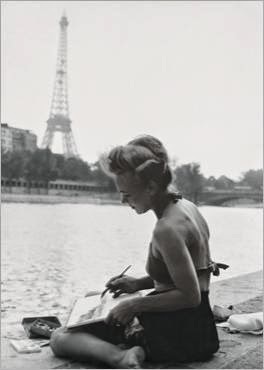 I've been writing in a journal every day after reading about "morning pages" in Janice McLeod's book Paris Letters. It gets to be a habit and I don't want to miss it. Your ideas about the personal menu and folding are things I especially want to try, but I enjoyed all the posts and got many great ideas. Merci!. Loved the series. It started me in a "recasting" mode, reminding me of several ways I've sort of slipped into old ways. Thanks very much! PS You and I are are quite a lot alike, I think. I enjoy people, but am most happy to be with my small family...and myself! I'm sure you're glad this is over, but I'm going to miss it. Thanks Fiona for the work you put into this. Not sure which my favorite was; so that's an opportunity to re-read them! Kudos to you Fiona for your lovely 30 Day Chic posts series. They were great and it sounds like you had an enjoyable time with them too. How kind of you to share your thoughts and personal way of living well on your blog. Have a wonderful rest of the summer! even I can't write a good english!I will , soon. I have enjoyed all the chic posts. I even read your previous 30 Chic Days. There was so much valuable information in the last 30 days that I cannot choose just one. I am going back to re-read them to continuing being "Chic". Thank you for your time, energy and beautiful words. I really enjoyed this series! It had inspired me to reevaluate my life in large and small ways. Thanks to you, I have joined the 6 o'clock club this week. Dear Fiona ... enjoy your blog so much but recently found I was not receiving the in the normal way. then I read this on Velvet and Linen and wondered if you are having the same problem? "Before I start this post I want to thank those of you who left comments and sent emails to me letting me know that you have not been receiving my posts. After doing some research, I discovered that many blogs who use Google's Feed Burner service to send out their posts were having the same problem. So, good bye Feed Burner! I am now using Mail Chimp instead. This is the first post that is being sent out by Mail Chimp... I hope you receive it!!!" Thank you so much for your comments and for participating in Thirty Chic Days. I'm tickled that you have tried some different things from the posts and comments. It means a lot to me! Nancy, I really appreciate you commenting about Feedburner as I was not aware of the problems. I am looking into an alternative email solution now. I really enjoyed the 30 chic days. It made me think about how I want to live my life and how I let myself be sidetracked by how others want me to live it. Fiona, this 30-day series inspired me in a number of ways...I think the idea that intrigues me the most is the Six O'Clock Club. I think if I could start this daily habit that it would make the most difference in my life, and then quite a few more changes could start to fall into place. Thank you for all these ideas! I loved this journey in June!